Like the rest of the nation, the state of Indiana is facing incredibly high rates of marijuana abuse among practically every age group. Data from the Richard Fairbanks School of Public Health at Indiana University indicates that marijuana is the most commonly abused illicit drug in the state. In 2016, the singular or co-occurring presence of marijuana was documented in nearly 21 percent of Indiana’s substance abuse treatment admissions versus the national average of 15 percent. Marijuana is often depicted as a benign or relatively harmless drug; however, its use can lead to serious cognitive impairment and is very often associated with the development of addiction to other drugs. Marijuana rehabs help patients cultivate a life without a constant preoccupation with marijuana. These programs very often represent an ideal alternative to incarceration. In 2014, Indiana had more than 10,000 arrests for possession and 1,903 arrests for sale/manufacture of marijuana, representing arrest rates of 1.6 and 0.3 per 1,000 population, respectively. Rehab can help low-level marijuana offenders avoid jail time and serious disruption to their quality of life. 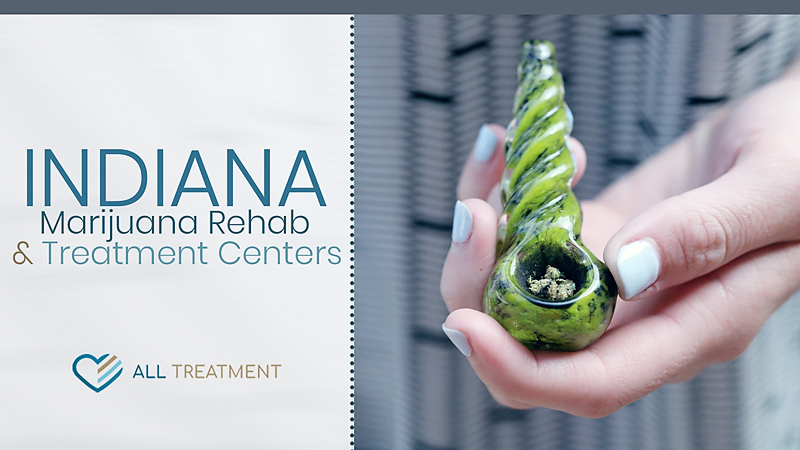 Indiana has a variety of marijuana rehabs that cater to each patient’s unique care needs and lifestyle, including programs based on gender, income level, co-occurring mental health issues and much more. Many of these programs are eligible for partial coverage through Medicare and Medicaid, as well as through private insurance.